As adults, we might be tempted to think of play as a frivolous activity without productive or educational benefit, unless it’s interweaved into some kind of learning program. Play is one of the many wonderful things in the overarching world of positive emotions, an oft-neglected ecosystem of appreciativeness and “wholesomeness” (as the Internet loves to call it these days) that children need to develop healthy worldviews and mental states. Like with play, there is a tendency to dismiss purely positive things because they might not seem explicitly productive. One of the best ways of reinforcing these positive emotions in your child is to use playful or appreciative inquiry, which is simply asking something like, “What’s the best thing that happened to you today?” Merely thinking about this question can cause your child to discover a world of positive thinking that they’d associate with joy and curious exploration, going hand in hand with the benefits of play. As parents, the best time to make use of playful inquiry is when your children get home. We’ve already covered that asking a generic question like “How was your day” may be met with an equally generic and uninterested answer, so how about some questions that evoke the best parts of the day? What nice thing happened at school? Which were your most enjoyable lessons? Even if they’re having a gloomy day, these questions may encourage your child to think about the good, rather than the bad and stressful. It may even prove to be helpful when dealing with after-school restraint collapse. 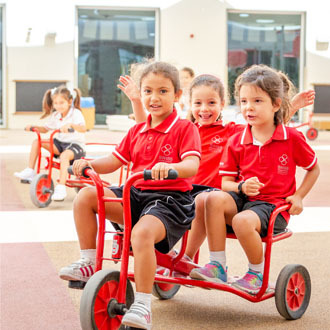 Swiss International School in Dubai believes that these positive emotions are an important driving force behind every child, and incorporates play and appreciative inquiry into its doctrines of pastoral care. Your child can look forward to a good day filled with opportunity and discovery every time they walk through our halls, or board with us.